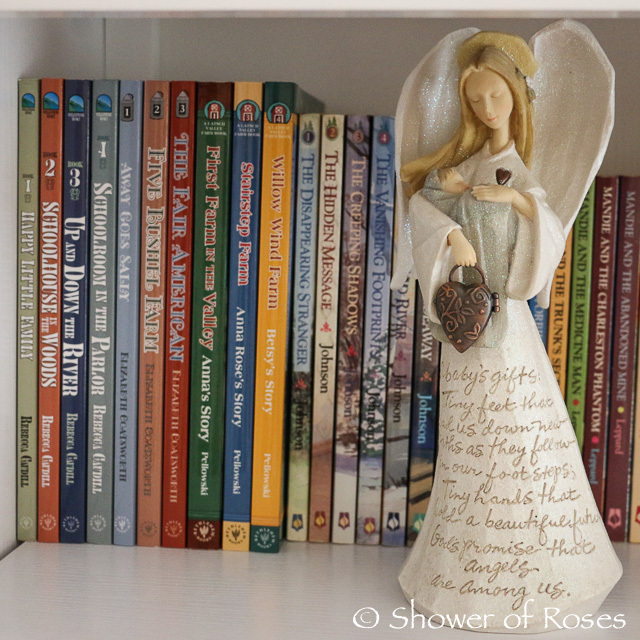 After posting pictures of The Big Girls' Bedroom earlier this month I had a few emails asking if I could share the books that are on their bookshelf. I thought I would put the list into another post in case anyone else is curious. 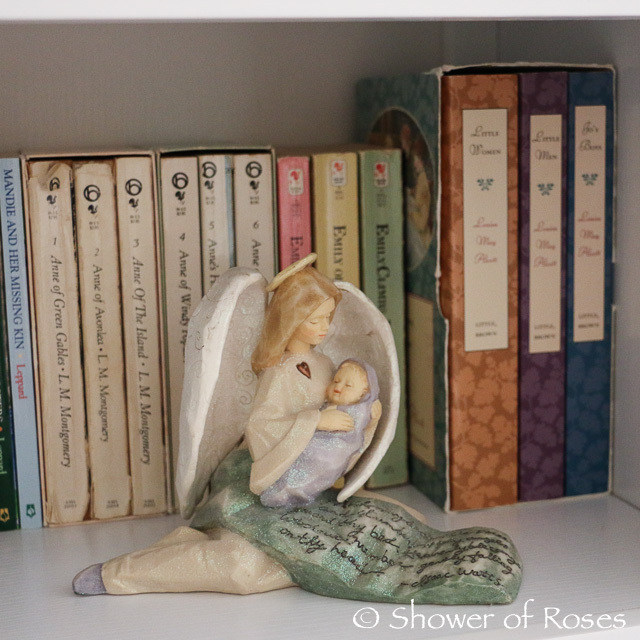 Most of the books in their room right now were either from my own childhood or given to them as gifts on their birthdays, Christmas or Easter, or sent from their grandparents. (Note: You can find lists of the books we've given them on holidays here and birthday gifts listed in the birthday party posts.) We keep all of our saint books on a bookshelf in the hallway and most of the historical fiction with all the other school books. We've been collecting the excellent books from Bethlehem Books for years. The Winged Watchman was one of our first audio books and it is still a favorite of my older boys. For the girls we've collected the Fairchild Series, The Latsch Valley Farm Series and the Sally Series. I have the Bantry Bay Series (The Cottage at Bantry Bay, Francie on the Run, Pegeen) and the Michells Series (The Mitchells: Five For Victory, Canadian Summer, Friendly Gables) stashed away in my closet to give the girls this upcoming Christmas. Our oldest daughter also has this Anne of Green Gables Audio Book. I'd love to order her a special copy of Anne of Green Gables for her birthday. Does anyone have a favorite edition to recommend? I noticed the new "Puffin in Bloom" edition will be released at the end of the month, I ran across the "Word Cloud Classics" version at Costco, and I was also considering the 8-Book Collection. Any other suggestions? On the next shelf you'll find our collection of My Book House, Volumes 1-12, a few favorite picture books (Louisa: The Life of Louisa May Alcott, Beauty and the Beast, The Magic Nesting Doll, The Littlest Matryoshka, and Martina the Beautiful Cockroach), Treasury of Fairy Tales the girl's copies of The Secret Garden (illustrated by Inga Moore and Tasha Tudor), Inside The Secret Garden, a vintage copy of All-of-a-Kind Family, Alice's Adventures in Wonderland and Other Stories (a Christmas gift from their grandma), Strawberry Hill, Kathleen: The Celtic Knot, and The Original Girl's Handy Book. 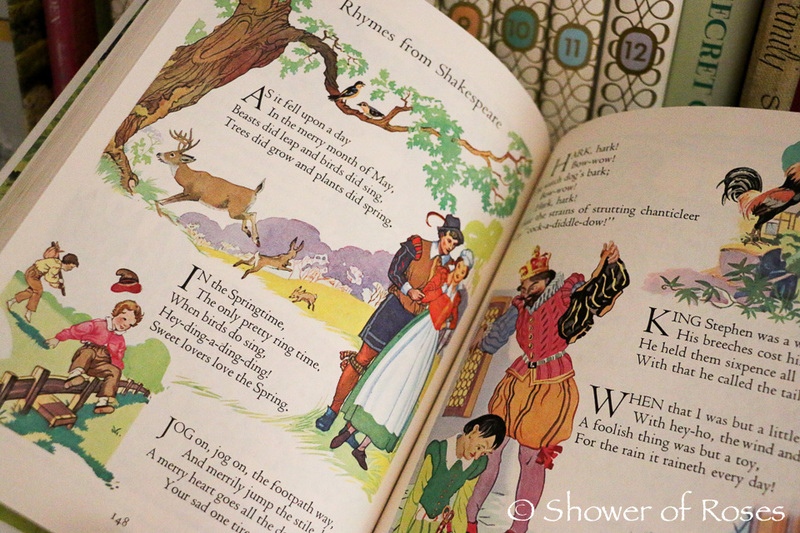 We love the My Book House Collection and the illustrations are gorgeous. The set includes In the Nursery, Story Time, Up One Pair of Stairs, Through the Gate, Over the Hills, Through Fairy Halls, the Magic Garden, Flying Sales, The Treasure Chest, From the Tower Window, In Shining Armor, and Halls of Fame. 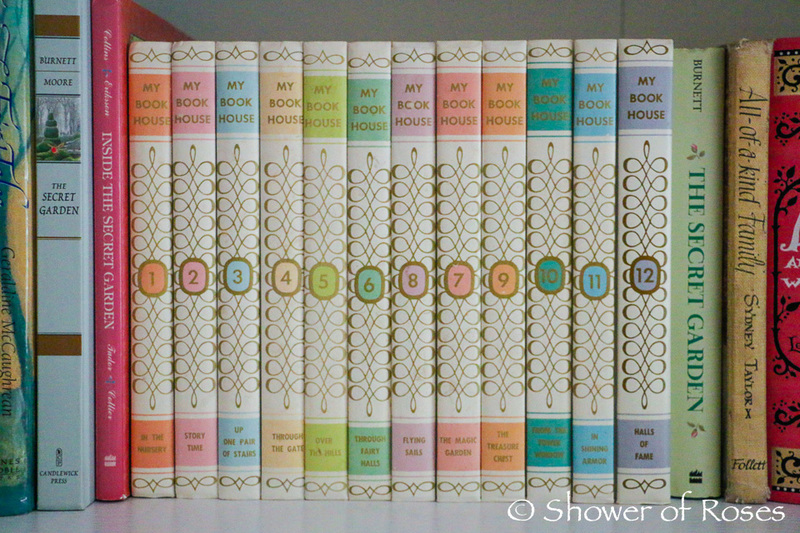 You can read more about the My Book House collection here. 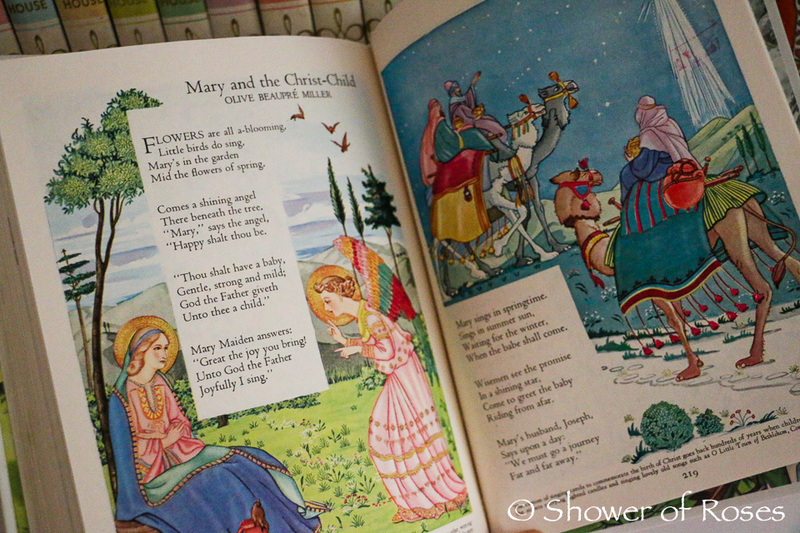 Twinkle Toes has started reading from In the Nursery (Book 1) to Rose which includes Nursery Rhymes, Rhymes from Shakespeare, and the beautiful story of Mary and the Christ-Child. 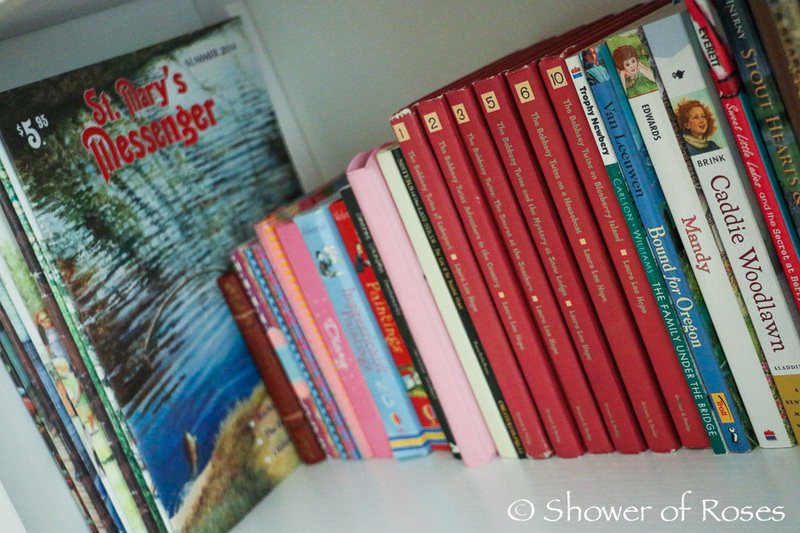 In the corner of the next shelf down you'll find our collection of St. Mary's Messenger Magazines. If you are looking for a Catholic Magazine for children these are excellent. 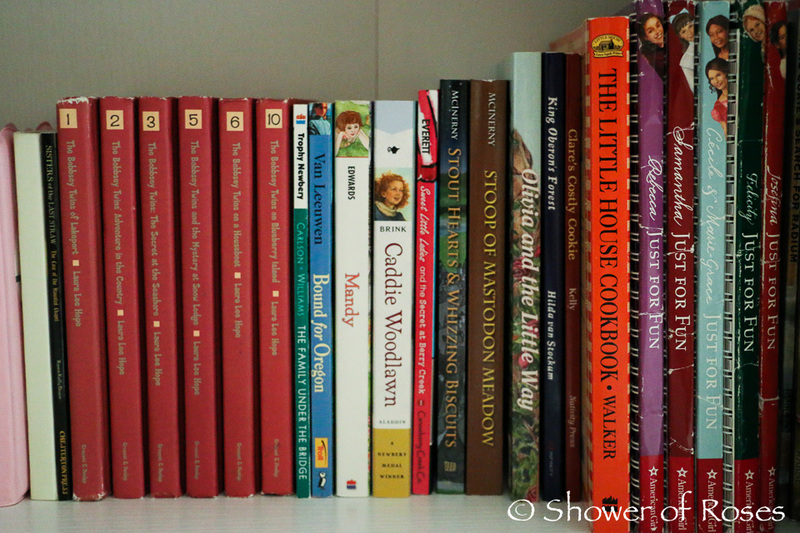 On the fourth shelf you'll find more of my childhood books including all my Nancy Drew books. There is also a paperback copy of All-of-a-kind Family, Little Town at the Crossroads, The Far Side of the Loch, Little House in the Highlands, Little House by Boston Bay, On the Way Home, and West from Home. 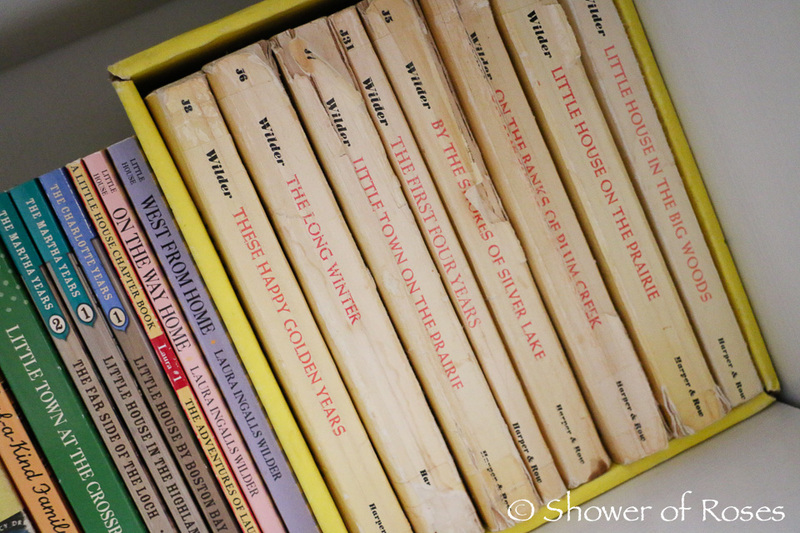 There is also my well loved box set of Little House on the Prairie books, I read them over and over as a child. The girls also love my set of The Chronicles of Narnia, but they are currently on the boys' bookshelf. 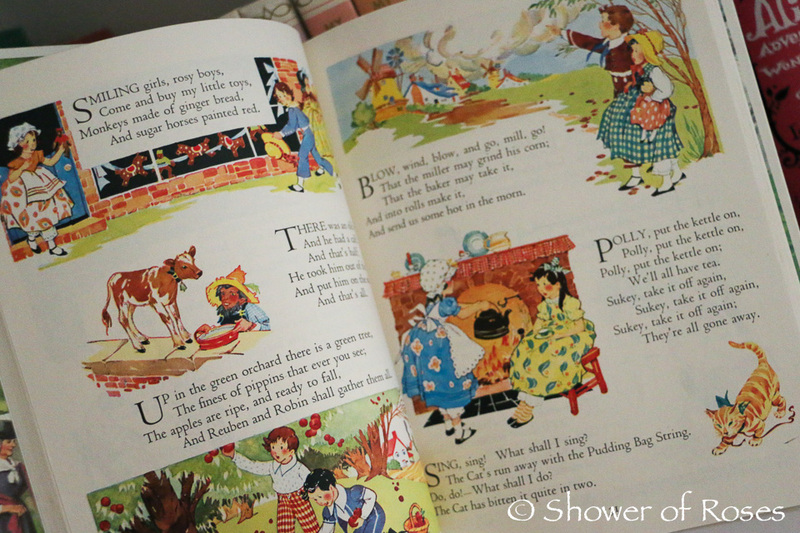 I also want to start collecting the Betsy-Tacy books for them, as well as the rest of the All-of-a-Kind Family series. I'm sure there are more books on their beds and around the house but I'm out of time for now. We are heading to town to run a few errands and then it's time for me to get back to finalizing this year's school plans!